The Tin Sheds – Norfolk Island boasts three spacious and luxuriously-appointed apartments surrounded by private landscaped gardens. 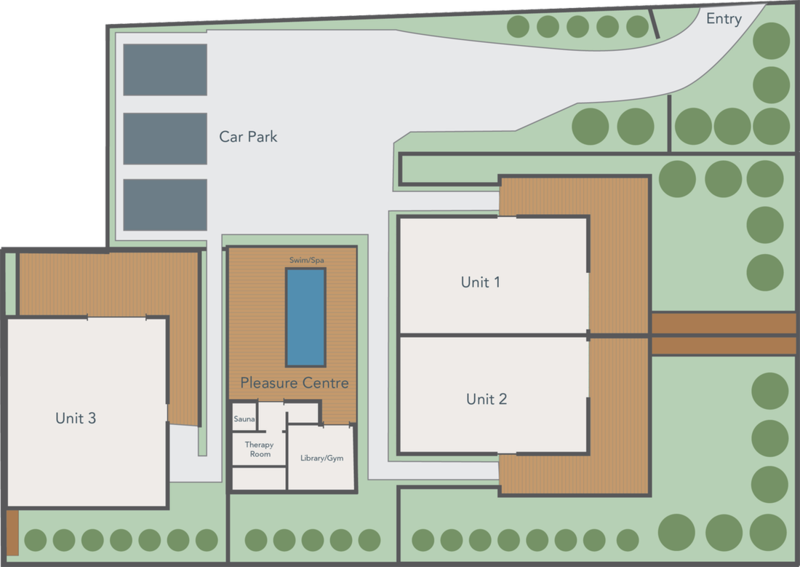 Unique to the property and common to all three apartments is an aptly named central leisure area called the PLEASURE CENTRE. A large decked area houses a heated SwimSpa which fronts two smaller rooms – one a library and mini gym and the other a therapy centre, complete with infrared sauna and massage room. An undercover carport in the common courtyard area. Surrounding the property and viewable from all the private courtyards is the beautiful natural landscape so unique to Norfolk Island. Magnificent Norfolk Island Pines fill the skyline and are surrounded by lush tropical plants. The peace and quiet of the setting is punctuated by the call of native birds. The property is nestled away at the end of The Village, close to the centre of town and just a minute stroll to the Burning Pine Shopping district which has cafes offering home-made delights, tour companies, the Visitor Information Centre, hospital and retail stores.